I’m a peace-loving person. So what drew me to the Penn Museum’s exhibition “Battleground: War Rugs from Afghanistan” wasn’t so much the sight of handwoven carpets loaded with bombs, helicopters, grenades, and tanks, but the opportunity to learn more about the people who made them, why they chose to depict such unusual imagery, and how these unique pieces wound up here. So Spooner decided to undertake a study of Oriental carpets in the summer of 1972, visiting places where they were being made in northern Afghanistan. 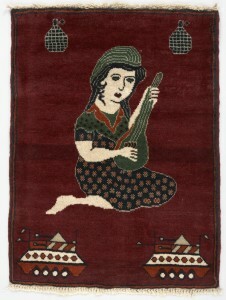 The following year, he invited a family of Turkmen carpet-weavers—a husband and wife, and their four-year-old daughter—to Philadelphia to create a carpet in the Penn Museum’s rotunda. “They wanted to do one with a portrait of President Nixon on it,” he says with amusement. “We politely declined.” Eventually, they reached a compromise: a small carpet featuring the museum’s logo. 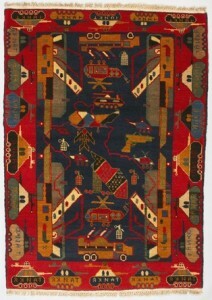 In recent decades, carpet-weavers and dealers began catering to Soviet soldiers and American GIs who were buying the rugs as souvenirs in the war-torn country. Some later sold their purchases into the international market. 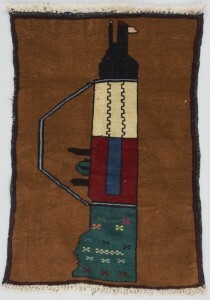 “The carpets you see here were all bought on eBay,” he adds, and then donated to the Textile Museum of Canada in Toronto where the exhibition originated. 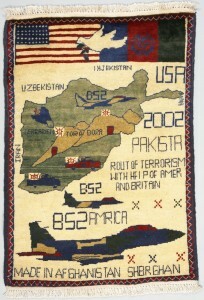 “Battleground: War Rugs from Afghanistan” is on view at the University of Pennsylvania Museum of Archaeology and Anthropology through July 31, 2011. 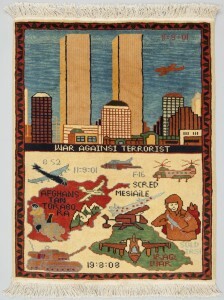 This entry was posted in Middle East and tagged Afghanistan, Brian Spooner, University of Pennsylvania Museum of Archaeology and Anthropology, war rugs. Bookmark the permalink.